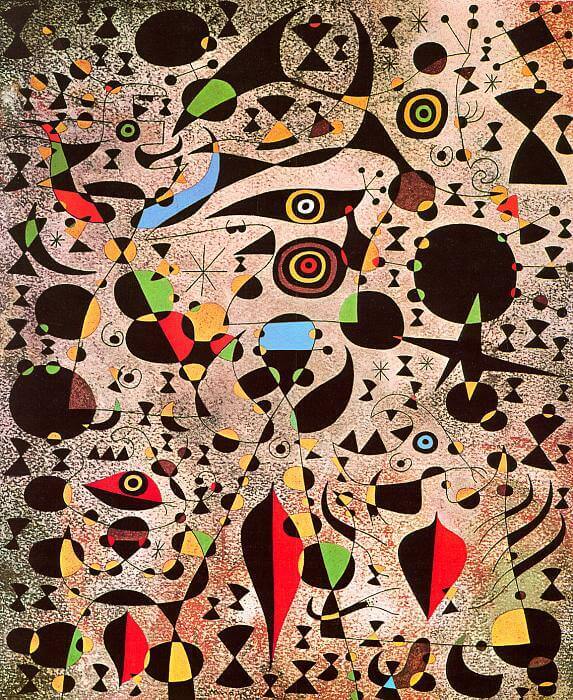 Miro had settled with his family in the small town of Varengeville on the coast of Normandy in 1939, and he would remain there until the advance of the German army made him decide to return to Spain the following year. A series of twenty-three small works on paper, painted in 1940 and 1941 and known as the Constellations, captures both his desire to escape a hostile reality and his response to the landscape and light of Normandy, so different from his usual Mediterranean surroundings. The sky and stars are the leitmotifs of this series. A tangle of lines and small, colored ideograms suggesting birds, allegorical characters, stars, and animals enlivens a vivid, textured surface. This imagery of the heavens led the painter to expand his sense of pictorial space. Despite their small format, these works look ahead to the system of organization of the large canvases, and many of the smaller ones, after 1941. In Women Encircled by the Flight of a Bird, the starts, each represented by two triangles placed tip to tip, and the successive positions of the bird surround the women and extend to the edges of the painting, weaving a fabric of lines and shapes that organizes the entire surface of the picture.